The dual aperture model Spectrophotometer CM-26d and the single aperture Spectrophotometer CM-25d enables digital color data management across increasingly globalized supply chains. It is ideal for evaluating color of automotive interior parts and smartphones/tablets exterior. 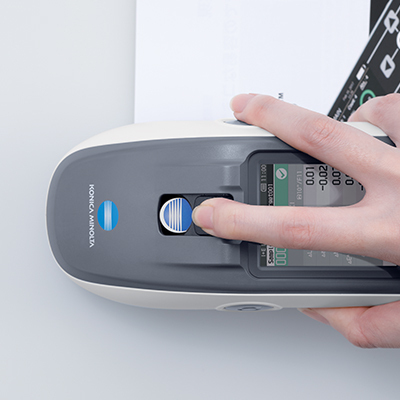 The new d:8° portable sphere Spectrophotometer CM-26d and Spectrophotometer CM-25d were developed for true “Digital Color Data Management” to help minimize the need of physical samples within a supply chain. With tight inter-instrument agreement levels of ∆E*ab< 0.12 (CM-26d) and high repeatability of σ∆E*ab 0.02 (CM-26d), the CM-26d and CM-25d ensures measurement data communicated within a supply chain remain consistent. The CM-26d and CM-25d comes with Configuration Tool CM-CT1 software (standard accessory) that allows user to not only create/write instrument settings, but also compiling it into a file and share it within its supply chain. When used together with Spectramagic NX Software, the CM-26d and CM-25d allows user to create workflow instructions with images. The CM-26 and CM-25d comes with a viewfinder for accurate positioning on sample or small parts. The symmetrical and compact design, allows measurement of hard-to-reach areas like vehicle interior. *1 Setting enabled by SpectraMagic NX (Ver. 2.9 or later, sold separately). *1 Optional Color Management Software SpectraMagic NX is required for setting user-configured illuminants or user indexes.